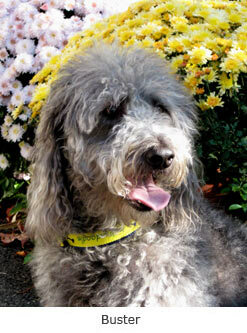 When Buster the Labradoodle bounded into our lives, all fur and frolic, we knew there was fun in store. But we did not expect it would be so hard to find hip, high-quality gear and accessories that let Buster (and us) show off our breed pride and fashion sense. Out of our fashion frustration, Happy Hybrid Hounds was born. Now, Labradoodles, Puggles, Goldendoodles, Cockapoos, and Schnoodles have a place to shop for collars, leashes, dog bowls, muddy paw towels, baseball hats, tote bags, and much more, made exclusively by Happy Hybrid Hounds. We also offer our line of Mutt Wear, featuring our Happy Hybrid Hound logo. We knew we were on to something when people began asking to buy our hats off our heads! One woman left a note on my car asking where she could buy our Labradoodle window sticker. It became clear that we just had to offer these products through HappyHybridHounds.com. We are a "mom and pop" shop, and had worked in high-end fashion merchandising for years. For six years, I owned Juliette McRoberts Sales, a NYC company that specialized in launching and selling the collections of new Women's Wear Designers in the USA and Japan. Our client base included Nordstrom, Barneys, Neiman Marcus, and Mark Shale, among others. So we know a little something about fashion, and we certainly appreciate and expect quality. All of our products are 100% satisfaction guaranteed. Almost all of our products are made in the U.S.A. In a few cases, we have not been able to find local sources, but our goal is to source in this country 100% of the time. We truly hope that you like our hybrid hound gear and accessories. Drop us a line, send us a picture, and keep stopping by as we plan to put seasonal and other fun items on the site throughout the year. Thanks for shopping with us! Our website was designed and written by Mythologie Creative, a New Jersey-based creative consulting firm that specializes in making websites friendly to people and search engines. Our logo was designed by Chris Hadden, a Maine-based illustrator and designer. Our legal services are provided by Alice Turinas, a corporate attorney serving NY, NJ, and TX.